Before you create your shrine you need to set your intention. Are you wanting to draw love near you? What are you wanting? What type of person do you want? Is there someone you are already in love with and dating that you want to draw closer to you? If so you can create a very special shrine that draws this energy to you. If you want something you need to know specifically what you want. You need to know the type of person, characteristics, and the outcome that you have in mind. Do you want a family with this person? Do you want children or a house? Do you want any pets? Get a very clear vision of the type of life you would like for yourself and the type of relationship you want. Visualize a kind relationship that is mutual and without worry. If you are working towards a specific person think about what you like about them, what makes them special to you. Why is this person so different from any other person? Think about what they like. Do they like flowers? Do they like candles? Do they have a favorite smell to them? Once you have thought of these things start to put your energy into creating a shrine. Remember the success of your shrine depends on the energy and love that you put into it. You need to dedicate time and care with your shrine’s construction. 1. Set up a secure area where no one has access to your shrine. This could be in the corner of your room, in a closet, or on a shelf. 2. Cover the area with a special cloth that you feel is appropriate. This sets the stage for your shrine and creates an energetic boundary for all of the objects. 3. If you have access to a metaphysical bookstore you can go there and pick some crystals that will help lend to the energy of your shrine. Some of the crystals that are associated with love are: Rhodochrosite will help you release fear and open your heart chakra. Rose Quartz will help you open your heart, feel love, and restore trust. Chiastolite will help you restore balance and harmony in your relationship. Rhodonite will allow you to release any hurt from past loves so you can let go and start to love again. If you feel grief and depression is standing in the way of you and true love use Apache Tears in your shrine to help absorb negativity. Clear Quartz is just a great crystal to add to your shrine to help elevate energy and intention and clear out any negative thoughts. 4. Now is the time to get personal. Every love shrine is unique because every person is unique. You can add a picture of the person. You can add objects that you know they like. If you want to remain anonymous on this don’t add a picture. Use your own intuition to focus on what you think and feel will draw that person or true love towards you. The more personal energy you place into your shrine the more energy will be given to the intention. So if you create art, write a letter, or even build something all this is energy, thought, and intention. I highly suggest creating a collage of items you want in a relationship and pasting them together on some paper or cardboard. You can cut out words from old magazines that pertain to you and even create headlines. Have fun with this and program each piece added. 5. Last but not least use incense, candles, and oils to decorate your shrine. 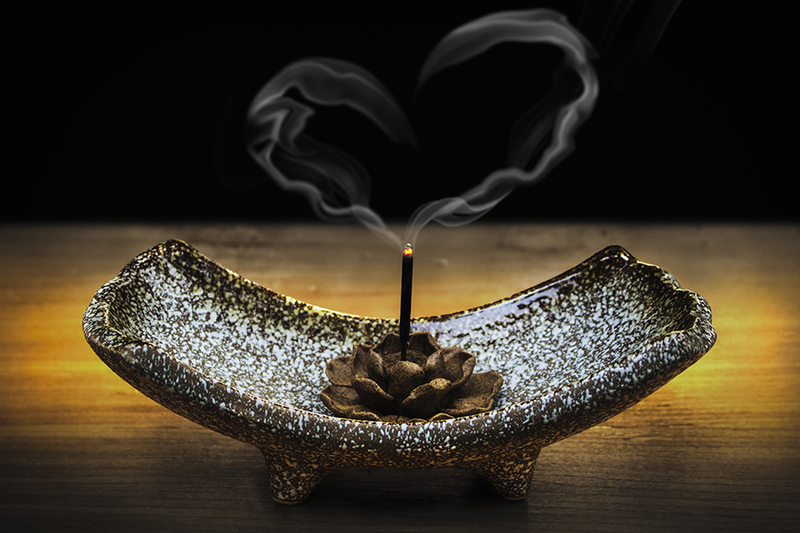 If you want to be safe and are not good with fire you can even use Flameless Candles I suggest lighting an incense and turning on your candle every time you are meditating. When you are meditating face your shrine so that the energy can flow through your shrine and back to you. I personally have only had to create one love shrine in this lifetime and I intuitively felt the need when it was time to do so. That love shrine would draw a man I met in Seattle, WA for 10 minutes to leave his work and his belongings and move to Atlanta, Ga three months after I moved. I had no idea he was the man for me, I only knew I felt drawn to go up and speak to him before I left Seattle. When I created my shrine I created it for my husband, but I had no idea who that was I only knew his energy was near. I put a painting I had created behind the shrine, I wrote a letter to my companion, dated it and placed it in a pink envelope under the my candle. I committed to burning that candle every day until he arrived. About a week later I would get a call from the man I met before I left and found out he was in Atlanta, GA visiting family and arrived March 20. I still had no idea on the coincidence. That Friday he came to my apartment, he walked in the door, and he pointed over to my shrine. He said, “that letter is for me.” My heart sank into my stomach. I don’t know how he even saw this letter because it was literally hidden under the candle for safe keeping but he knew it was there and he knew it was pink. I gave him that letter later on in the evening and we have been married ever since and together for 18 years and have a beautiful family of four children. You can read more about my life in the book Living On Intuition (updated url coming soon). Love shrines have a lot of power to them and they help us focus on our intention and really hone in on what we want in a relationship. Have fun creating your shrines and use your intuition to help craft them, your first intention almost always is the right one.